March 2014 - Denver Prophit Jr.
January 2, 2015 March 26, 2014 by Denver Prophit Jr.
July 17, 2015 March 26, 2014 by Denver Prophit Jr.
April 5, 2014 March 25, 2014 by Denver Prophit Jr.
November 18, 2017 March 23, 2014 by Denver Prophit Jr.
April 7, 2014 March 23, 2014 by Denver Prophit Jr.
August 23, 2016 March 23, 2014 by Denver Prophit Jr.
December 16, 2017 March 23, 2014 by Denver Prophit Jr.
Blogs, YouTube, Facebook, Twitter, Google+, and other platforms are giving everyone a “voice,” including organizations and their customers. So how do you create the stories, videos, and blog posts that cultivate fans, arouse passion in your products or services and products, and ignite what you are promoting? 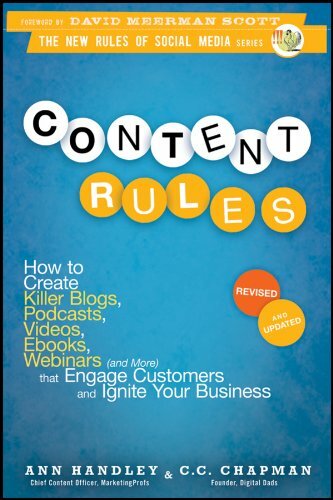 Content Rules equips you for online success as a one-stop source at the art and science of developing content that individuals care about. This coverage is interwoven with case studies of companies successfully spreading their ideas online and the usage of them to ascertain credibility and build a loyal customer base. February 22, 2017 March 22, 2014 by Denver Prophit Jr.
Is Twitter Phasing Out Hashtags And At-Replies? March 23, 2014 March 19, 2014 by Denver Prophit Jr.